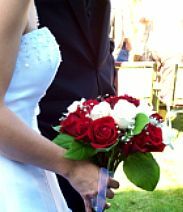 Bridal Bouquet-- Stunning 24 rose handtied bouquet, accented with greenery and ribbon. Three Bridesmaid Bouquets-- 12 roses each with accenting ribbon and greenery. Flower Girl Bouquet-- 6 roses handtied with accenting ribbon. This is also suitable for a guest book bouquet or toss bouquet. Corsages-- Two pin-style mother's corsages of either spray or standard roses and accenting details. Buttonholes-- A total of seven buttonholes for the groom, best man, two groomsmen, ring bearer, and two fathers. Scattering Petals-- A box of coordinating rose petals to scatter on the aisle or on tables.